WBO Light Flyweight World Champion Angel "Tito" Acosta (19-1, 19 KOs) of San Juan, Puerto Rico hosted a media workout today at Legendz Boxing in Norwalk, Calif. ahead of his battle against Ganigan Lopez (35-8, 19 KOs) of Mexico City, Mexico in the co-main event of Garcia vs. Lopez on Saturday, March 30, 2019 at Fantasy Springs Resort Casino in Indio, Calif. and which will be streamed live on DAZN. Aaron "Silencer" McKenna (6-0, 4 KOS) and Herbert "Ace" Acevedo (15-2, 6 KOs) all participated in the workout ahead of their fights, which will take place on the undercard. 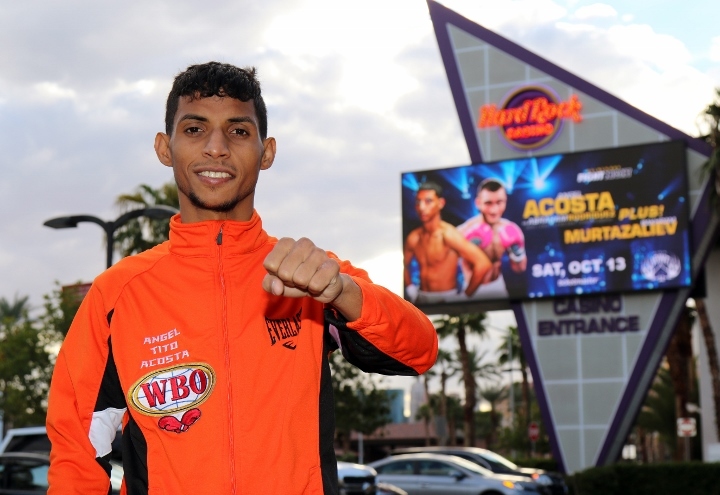 "I feel very happy because of the support from Golden Boy Promotions and Miguel Cotto Promotions. I'm delighted for the opportunity to fight on DAZN. I've been working hard for this fight. I've been in camp since January 27 because I thought I was going to fight on March 16. But then I got the call to fight on March 30. Either way, I'm excited to defend my title for a third time." "Training with Freddie Roach has been something else. We've had two fights with him, and it's been really great. My goal right now is to keep defending my title, but if the opportunity to unify presents itself, we will take it. But right now, I'm not thinking about any other opponent. I'm focused on Ganigan Lopez. After that, we can talk about other opponents." "It would be great to fight on DAZN. It's a huge platform, and DAZN has a great audience. It would be great to have that exposure. For this camp, we did 180 rounds of sparring. I'm in the best shape we could possible. I'm the strongest I've ever been for any fight. I've sparred with Javier Molina and with Alexander Besputin. My plans this year are to fight six times and hopefully to fight for a small belt early next year." "I know I have it in me to be successful, but I never had a management team or a promoter behind me. So, my career was going slow. So we decided to move to a different team to Westside Boxing, and thanks to them we are now with Golden Boy. I'm thankful that I'm working with the right people now." This creepy looking dude is a famished anorexic!!!!! !